Every year we relive the wonderful Christmas story. The Gospel according to John summed up this magnificent story in a single line: The Word became flesh. That takes us back in our imaginations to the beginnings of the human family, in Genesis: when man and woman walked with God, had friendship with God and one another. But somehow man and woman lost that friendship, they fell from grace: they hid from God. But in the midst of ancient Israel’s fidelities and infidelities to the covenant, God never reneged on his promises. And so the Word became flesh and made his dwelling among us. Isaiah proclaims glad tidings: the people who walked in darkness have seen a great light. Paul writes that the grace of God appeared in Jesus Christ who made us “heirs” to the promise of eternal life. In the Gospels according to Matthew and Luke, the Virgin Mary gave birth to her son. She wrapped him in swaddling clothes and laid him in a manger.And the Gospel of John sums up the meaning of Christmas: the Word became flesh. That is God’s greatest gift to us. Some gifts really transform the lives the people: gifts of teaching, of listening and supporting, of sharing time and experiences, of compassion and forgiveness and affirmation. This begins in our own families and workplaces and communities: enduring gifts that we can always give to one another. The Word became flesh. That single line changed our destiny. 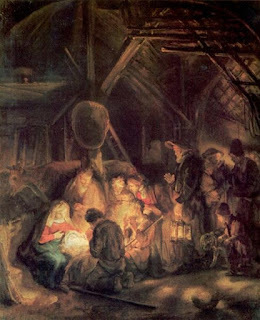 Christmas means not simply God in Bethlehem centuries ago, but God within us. We carry within ourselves Emmanuel, God with us. How? By virtue of the life-giving waters of baptism.We gather to proclaim the awesome Word of God, to celebrate the presence of the living Christ. That great truth of our faith, God within us, challenges us always to look for the good in ourselves, in other people and in all situations in life. And who is the ultimate good-finder? God so loved us that he became one of us. Yes, Jesus had a unique relationship. He was God-man. A healer, a teacher, a peacemaker. Think of all the people in the Gospels that Jesus met: the blind, the leper, the lame, the sinner, the forgotten. And Jesus found goodness in all of them where many didn’t. The promised Messiah has come, He is in our midst mystically in the word proclaimed and the sacrament celebrated, and He will come again in power and glory at the end-time. In the meantime, pray this Christmas season that the Lord will help those who doubt to find faith; those who despair to find hope; those who are weak to find courage; those who are sick to find health; those who are sad to find joy; and those who have died to find eternal life in God.